Graeme Devine of Santa Cruz, CA recently posted a gorgeous video made from several hours worth of exposures of the Milky Way. He took the shots from his front porch. His work really shows off what you can do with a DSLR hooked to a computer. Most DSLRs come with software that lets you take timed exposures at specific intervals. To nail the aim, focus & exposure, set your camera on a tripod, connect it to your computer and take single frames until you get the look you’re going for. Manual mode with 15 second images at ISO1600, f/5.6 and a fairly wide angle (24-35mm) is a good place to start. Tweak your settings until you get everything how you want it. Depending on your viewing location’s darkness, your image settings may vary drastically. After everything’s set, shoot images every 30 seconds for as several hours. Noting when the Milky Way transits your field of view is important – as is dodging the moon. Remember that most video is rendered at about 30 frames per second. At one shot every 30 seconds, it’ll take 7 1/2 hours to put together a short 30 second video. Once you have all your shots, you can render them to video using your favorite video editing software. Celestron Hand Controller Problems Fixed! For several years, my Celestron telescope’s NexStar hand controller has been getting fussier & fussier. On my last dark sky trip (many hours from home), the hand controller stopped responding. I messed with it in the field for about 5 hours that night…cycling power, attempting realignments, etc. Nothing worked. The one time that night I got the scope’s computer to align, the hand controller stopped responding as soon as I sent it to my first target. I spoke with Celestron about it and their best suggestion was to send back the entire mount so that they could work on it. Their estimate to just look at it was $200. They did tell me that the first thing they’d try was a new hand controller. So, instead of sending in the telescope, I tried to order a new hand controller. Except for places I didn’t want to order from, everyone was out of stock. Months went by. No hand controllers. Fed up, I started digging around the internet again for a solution. I found a post where several people had similar problems. I tried their solution and it worked! It looks like the LCD ribbon cable works loose in the Celestron hand controller. I took apart the hand controller (just 6 screws), pulled back the two tiny black ribbon locks, then removed the LCD ribbon. The contacts were dirty, so I used some non-residue electrical contact cleaner and a cotton swab to clean them up. I put everything back together and the scope fired up and aligned without a hitch. I’ll drag it out at night next weekend to give it a good checkout. Hopefully, this 10 minute fix saved me $150. You wouldn’t think that an LCD ribbon would mess up the mount’s ability to slew around & receive commands from my laptop. Still, it looks like they might be related. Here’s the original thread at Cloudy Nights. Despite being “no-go” for weather until nearly the last minute, Space Shuttle Endeavour launched this morning for STS-130. Seconds after launch, they punched through a thin cloud deck – reminding me of the launch of STS-123 in March, 2008. Main engine cutoff (MECO) happened about 4:22am EST and Endeavour is now safely in orbit. The DSLR that I use for astrophotography is the Canon EOS 5D Mark II. It’s an amazing daytime camera and it has great low light capabilities. Canon recently released new firmware for the 5D Mk II, version 1.2.4. Among other things, this update includes fixes for problems with noise in long exposure bulb photos. Astronomy Nightly Forums are up! The forums are now up and running here at Astronomy Nightly. Please take a minute to take a look around. Make a post asking a question, answering a question, or just saying hello. The more you use the forums, the better place they’ll be. Enjoy the community. Winter is a wonderful time of year for viewing. Winter brings air with low absolute humidity and great deep space targets. If you’re into astrophotography, the colder temps will help keep the noise down in long exposures of your digital camera. The down side is that cold winter air tries its best to break your will to enjoy the skies. In the northern hemisphere, winter brings some of my favorite visual and photo deep space objects into view. Before Christmas, Pleiades (Seven Sisters, Messier 45) is overhead at sunset. With even modest binoculars you can clearly break out more than just seven sisters. A low power telescope and non-city skies reveals a hint of nebulosity connecting the cluster. Sixty second photos start to break out the Pleiades’ striking cotton candy-like blue nebulosity. The #1 beginner astrophotography target in the winter has to be the Orion Nebula (M42). The nebula’s intricate details bring pro photographers back year after year. In January and February, M42 is high overhead at sunset. It’s so bright that even here in the Las Vegas suburbs you can see its blur of nebulosity with unaided eyes. It’s brightness definitely lends itself to budding astronomers and astrophotographers alike. The triangulum region and nebula is nearly as striking the first time you see them as Saturn’s rings. Beginner astrophotographers can test their polar alignment and focusing skills by taking simple 30 second photos of the nebula. Shooting prime through most telescopes at ISO1600 and 30 seconds, much of the nebula – including its color – is visible. Over a 30 second exposure, most equatorial or wedge-mounted fork mounts can get by at least half the time without any manual or autoguiding. 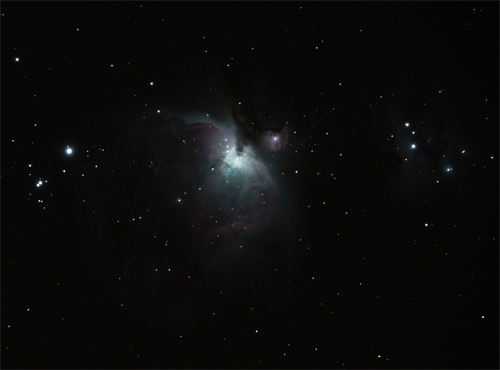 The photo below shows the Orion Nebula at, to the right, its companion the Running Man Nebula. It was taken by a Canon 5D Mark II through a Celestron 80ED. It’s a combination of 5 unguided shots at 30 seconds and ISO1600 and 5 unguided shots at 30 seconds and ISO3200 (with processing in Nebulosity and Photoshop). A great, but more challenging target for later in the winter is the Rosette Nebula (NGC 2244). Its brightness is spread across a huge area over a degree across. The star cluster near its center lets you know you’ve found it. Multiple autoguided exposures of 5 minutes or more are best to bring out all of the Rosette’s size and gorgeous detail. This winter (2010) Mars is also a good show. While not as big in your eyepiece as four years ago, the red planet is still worth a place on your winter viewing list. Don’t procrastinate though. It’ll retreat to just a spec before too long. So, bundle up & enjoy the winter skies. Share your eyepiece and photos with friends and family. Find a target that “wows” you and introduce children & adults to the stars. Astronomy Nightly is on the way. We’ve installed our backend software and are in the process of customizing the look & feel of the site. A forum will be up soon too.